NKU is ready to unveil a new 105 million dollar state-of-the-art learning center focused on health sciences. HIGHLAND HEIGHTS, Ky -- A new state-of-the-art nursing and health science learning center at Northern Kentucky University shows the need for medical professionals is growing. 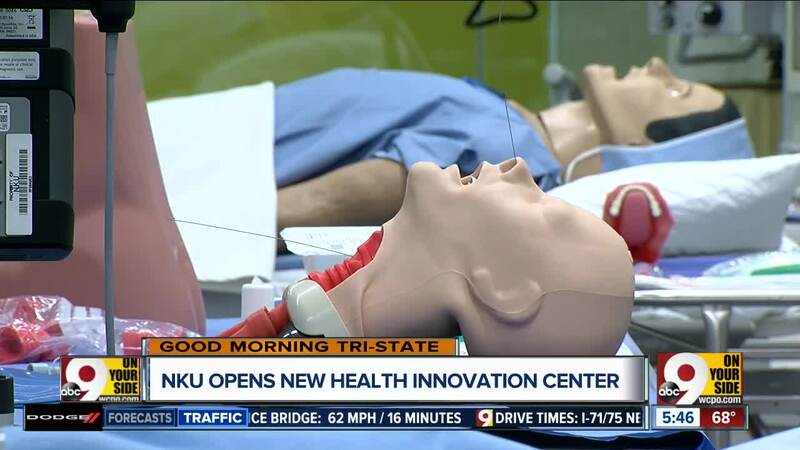 “The equipment, the mannequins, everything is state of the art,” NKY College of Health Professions Dean Dale Stephenson said. The 105 million dollar facility opens to students this fall, and helps to fill a growing need to educate more medical workers in Kentucky. “There was a void and I think this is a way of making sure we have the ability to support the needs of this region,” NKU president Ashish Vaidya said. Starting next fall, 35 medical students will make up the first class on campus, as part of a partnership with St. Elizabeth’s through the University of Kentucky’s College of Medicine . The new facility is designed to make learning realistic. “Having a simulation center here on campus allows us to expand our clinical experiences,” Stephenson said. Medical professionals can observe the simulated operating room and then debrief with students afterward. “We actually have cameras within these simulation settings where we’ll film all aspects of the simulations and then we’ll replay it.” Stephenson said. About 6 million dollars of the school’s budget went towards technology. NKU will dedicate the new building next month.